The reviews are in and CHESS is a HIT! Are you where you want to be and who you want to be and doing what you always said you would? Tidewater Players, the resident theatre company of Havre de Grace, is where they want to be and who they want to be and doing what they always said they would! Making a bold move by opening their 2018/2019 season with a politically charged production of Chess (the musical in concert), Tidewater Players stands to set the tone for their season with this shocking opening gambit. Avoiding the trappings of the done-to-death Shreks and Mamma Mias, Tidewater Players takes full advantage of the darkened political climate in which we currently live, and seizes the opportunity to showcase this strikingly relevant and potent musical. Directed by Mark Briner with Musical Direction by R. Christopher Rose & Stephanie Carlock Cvach, and Choreography by Bambi Johnson, this haunting tale of political games is a raw reminder to the world that art imitates life, imitates art, imitates life…. Read the rest at TheatreBloom.com. The Cold War, an international chess championship, political relations between The United States and The Soviet Union, spies, friends, enemies, lovers, enemies who become lovers… it’s all going on at Tidewater Players in their latest offering, Chess, with Music by Benny Andersson and Bjorn Ulvaeus, and Lyrics by Tim Rice. All this fodder and music by the dudes from ABBA can’t go wrong and, wherever you stand on Chess (some love it, some hate it), there’s no denying that Director Mark Briner, Music Director R. Christopher Rose and Stephanie Carlock Cvach, and Choreographer Bambi Johnson knocked it out of the ballpark with this better-flowing, energized concert version that tells the story completely and cuts out all the muddle…. 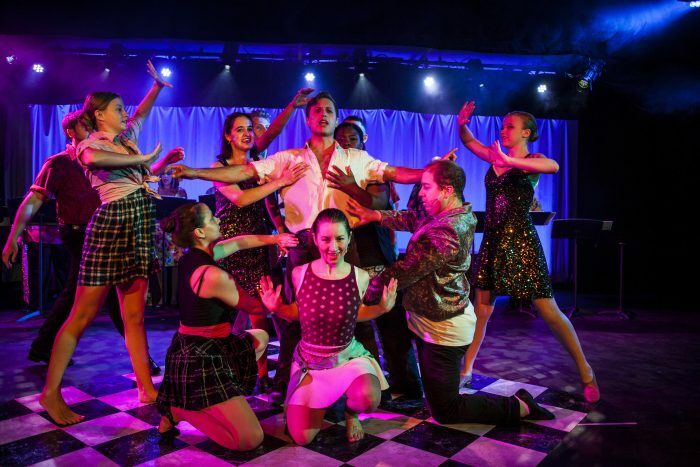 “Chess” is a musical notorious for its many varied adaptations and revivals, including a recent West End revival; the Tidewater Players’ production, directed by Mark Briner, was the Maryland premiere of this new and improved version. The show, which features a score composed by ABBA’s Benny Andersson and Björn Ulvaeus and lyrics by Tim Rice, centers around the 1984 World Chess Championship in Merano, Italy. The two competitors—the returning champion, an American named Freddie Trumper (Rob Tucker) and a Soviet Russian named Anatoly Sergievsky (Shawn Doyle)—go head to head not only in a game of chess, but also in games of the heart as they compete for the affections of Florence Vassy (Barbara Hartzell), Freddie’s second….